Reportage about the visit of the royal family to Groningen. Reportage about the visit of the royal family to Groningen. 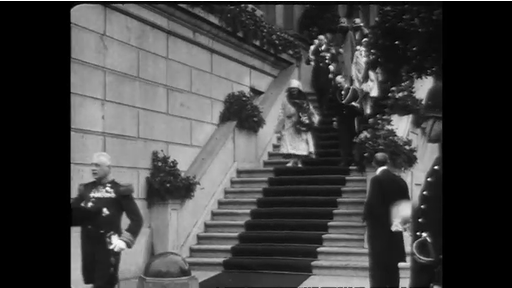 Queen Wilhelmina, Princess Juliana and Prince Hendrik arrive at the city hall and are welcomed by Mayor Bosch van Rosenthal. A procession of the Groningen associations passes by the city hall. Departure to the University of Groningen. The student body and alumni pay a tribute to the royal family.